As the arctic blast swept down on New England we were not raising sail; rather, we stoked up the wood stove, soaked the beans, nixtamalized the corn, oiled the Singer 107, and had folks over for a sail raising. In a couple days of fun sewing and communal living we completed the mainsail and mizzen for Gemma, the cat-ketch daysailer. 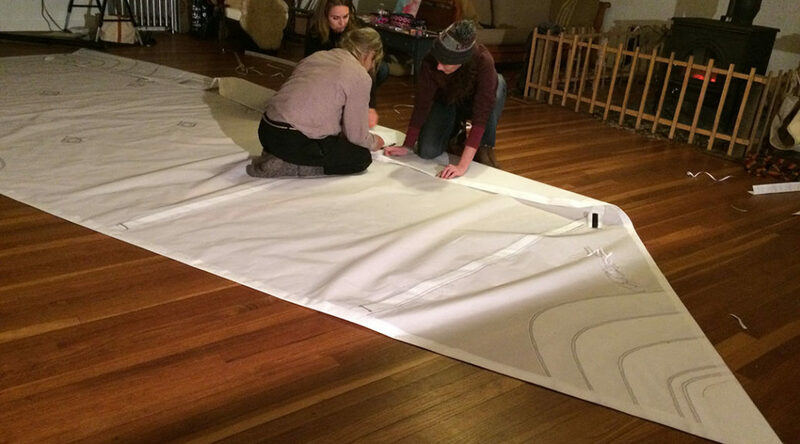 Designing and building a custom sail is not trivial. Once the masts were made and the booms mocked up on the boat, John and I measured the spars and then pondered and then re-measured. In addition to imagining how to optimize the use of the spaces created by the spars, we had to imagine sailing, trimming, reefing, rowing, and even camping on this boat that did not yet exist. We imagined dropping the mast to row under a bridge, trimming the mizzen flat to work up wind, tuning the tension on the sprit boom to let in draft in lighter air, and how letting the sheet all the way out on a run would cause the mainsail to deform. When the sail is lowered how will the mast hoops pile up by the tabernacle? This is what psychologists call “counterfactual reasoning”–thinking about something that does not yet exist! It is how the first of anything gets built, and takes intense concentration and imagination. It is harder still in the dead of winter, when to imagine sailing, rowing and camping on a dinghy is that much more counterfactual. And imagining like this is fun. You can’t sit still while you think through the details; instead your hands reach for a halyard, one hand moves an imaginary tiller, the other pops the sheet out of a jam cleat. Your head ducks as the imaginary boom passes over. jibs make learning to sail a little harder. What if students learned on a cat-ketch instead? The cat-ketch rig is self-tending, has fewer complex interactions between the sails, and has the benefit of the mizzen for tuning the helm balance. And no wildly flapping jib on the foredeck. By lowering the mast top a couple feet the cat-ketch will be able to sail under the rt.88 bridge, making both branches of the Westport River easier to explore. 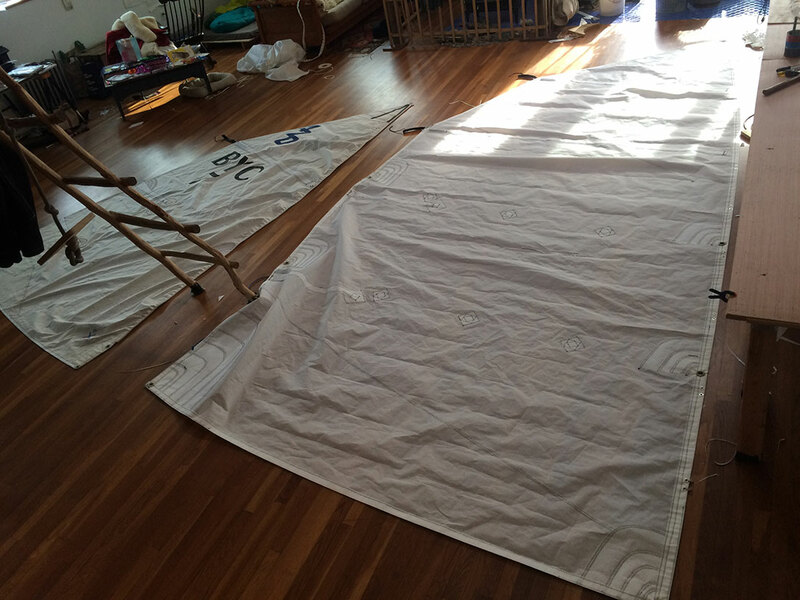 By having no shrouds and a 180 degree sheeting angle, the sheets can be spilled on any point of sail which should help novice sailors become good beach landers and general boat wranglers. The new rig will, like the legacy rig, have no spars aloft. Just a couple of full battens. The cat-ketch sail plan, with two reef points in the main and one reef point in the mizzen, will have more possible sail combinations. The cat-ketch has 15% more sail area with a center of effort 5” lower than the legacy rig. Good light air sailing (on summer mornings) is the stuff of great memories. Sprit booms are interesting gimmicks—they allow control over leach and foot tension simultaneously and thereby reduce sheeting loads (since the sheet is not vanging the leach tight). They also pass higher over the cockpit and provide (hopefully) a decent armature for a cockpit tent for camping. The cat-ketch should point poorly compared to the legacy rig—we will be able to compare the cat-ketch to the legacy rig and explore the differences thoroughly. Out of all of these considerations came a profile drawing, which was called “lu’s sail-plan-cartoon”. Further refinement led to some actual specifications for the new sails. The sails look similar to the sail from the 420 dinghy. In fact, the mizzen is a 420 dinghy sail, with the foot re-cut. The main will be a larger slightly higher aspect ratio version of the 420 mizzen, with two full battens instead of one. There’s no headboard, and the luff will have thimbles through which jacklines will pass to permit the sail to move aft and down from the hoops when reefed and struck. At last the sail cloth arrived. Before laying out the pristine panels on the floor I vacuumed and vacuumed again.Then I unrolled the crispy sheets and watched as black cat hair from my two big loft cats somehow-as-if-from-nowhere drifted and stuck with static attraction to the white cloth. Soon the panels were all marked up with chalk and notes, and crumpled from being stuffed under the throat of my ancient Singer. And then help arrived. The sail raising was in full swing. Corner patches were basted up, reef points sewn on, and luff tape hot knifed and creased. Since there is no pit here, sewing is done on a 16′ x 4′ table, and that makes extra people indispensable, as two people help feed the cloth rolls on to and off of the table while one person operates the machine. The machine is a cranky old Singer 143W2 which most mechanics just call “a 107”. It is a drop feed zig-zag machine with plenty of power. 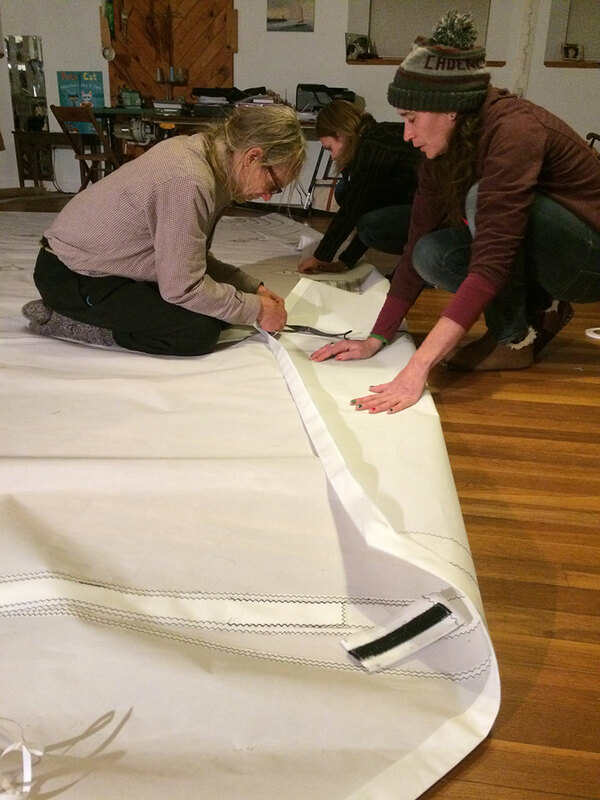 Unfortunately, the dogs on the drop feed mechanism just can’t hold on to and feed filled dacron sailcloth, so it is fiendishly difficult to sew straight and feed evenly. I wonder if I can trademark the drunken seams and variable stitch length (along with the cat hair!). As for the drop feed zig-zag, this is something I don’t understand: It is possible to acquire a compound feed straight stitch machine for $500; it is possible to acquire a drop feed zig-zag machine for $500; but it is impossible to find a compound feed zig-zag machine for anything less than $3,000. I like to think I don’t mind this. I love my antique machines and the wobbly results. However, someday I’ll find a Consew 146 and perfection will tempt me. To accentuate the trademark seams, we used black thread. When the last seam was basted and fed through the machine and the finished sail unrolled on the floor, we performed a ritual. We all stood around the sail and supported it from it’s corners, then lifted it off the floor with a little whoosh to fill it with air. For an instant we glimpsed its functional shape, an exciting moment! But like a boat that is only half done when the hull takes shape, there was still a lot of work to do on the sails. Grommets to set, worked holes to sew rings on to, thimbles to lash, and battens to fuss over. This is the kind of picky work I can only imagine doing with friends around the wood stove when it is 0 degrees outside. A special thanks to John, 1st Mate Kate, and Grainne for making the sail raising happen. And plenty of gratitude to Mark and Julia at Squeteague Sailmakers for putting this mainsail on the computer and cutting out the panels. And to Terry and Challenge Sailcloth for help with the fabric. But all this work makes us wonder: How in the world was this done in the days before computer aided sail design? When the broad seaming between the panels was done by eye or by laying a batten down and striking a curve, how was it possible to get a satisfactory 3-D shape in the finished sail? And before stretchless fabrics like dacron, the whole process was even more uncertain. In the pre-computer days sails were cut, sewn, tested, and then re-seamed and re-edge-curved several times to get the cut correct. Now with computers and dacron we take it for granted that the finished shape can be controlled at the drawing board. Of course, ending up with the computer’s shape and ending up with a sail that works well are two different things! We are resolved to the possibility that, as in the days of old, we will be back on the loft floor again!